Southern Oregon Pediatrics Bi-Weekly Baby Group. Learn how to communicate with your baby through massage, sign language, dance, music, and stories. Ask the experts about breast feeding, nutrition, sleep patterns, and positive parenting. 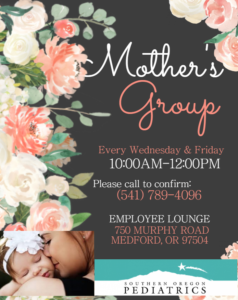 Every Wednesday & Friday Employee Lounge 750 Murphy Road, Medford, OR 97504 ALL MOTHERS/PARENTS AND BABIES ARE WELCOME! Please confirm events before your travel.